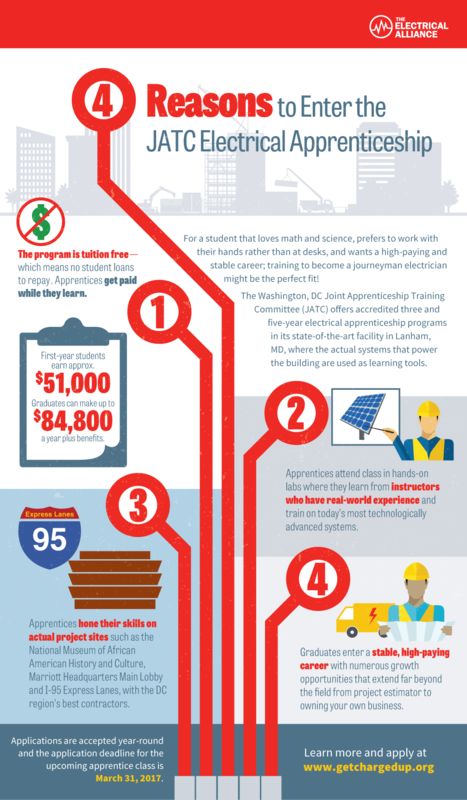 The JATC Electrical Apprenticeship, based in its state-of-the-art facility in Lanham, MD, trains the Washington, DC region’s best electricians. Applicants can apply year round—the deadline for the upcoming class is March 31, 2017. Share our new infographic with anyone you know who is interested in math and science and looking for a lifelong, high-paying and stable career! Plus, learn more about electrical apprenticeship at www.getchargedup.org.